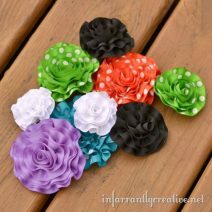 Fabric flowers are all the rage and can be used in so many ways, whether it’s in your hair, on a pillow, even your favorite outfit can be made to look more trendy! I am always on the look out for a good flower tutorial. Here is a great round up of some fabulous flowers! I also love crochet flowers. Don’t miss these lovely crochet flower patterns. 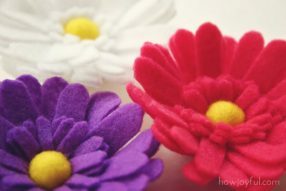 Choose any one of these tutorials to learn how to make fabric flowers. 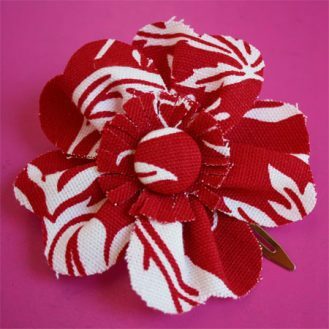 From ribbon flowers to felt flowers you will find the perfect fabric flower patterns. 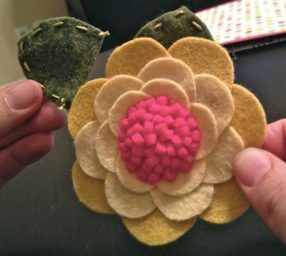 Felt works great for fabric flowers. It has a nice weight to give flowers body and you need not worry about raw edges. 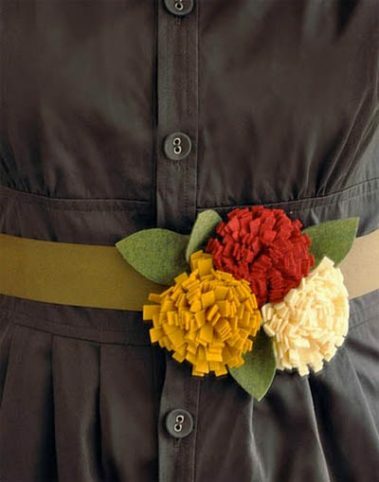 Felt blooms make the perfect adornment for a belt. 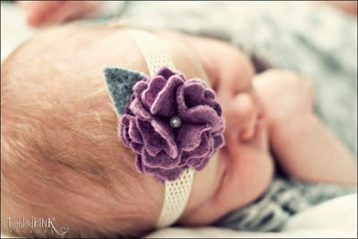 This box fold felt flower looks lovely on this sweet baby’s headband. 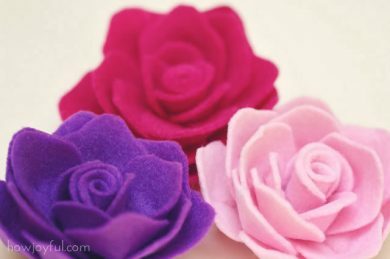 Look at all the gorgeous felt flowers that you can make! Be sure to scroll clear to the bottom to see the amazing sweater embellished with fabric and felt. What an amazing display of textures. 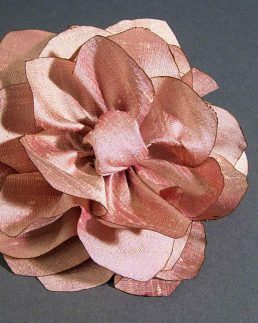 Create this sweet pomela flower out of a strip of felt. 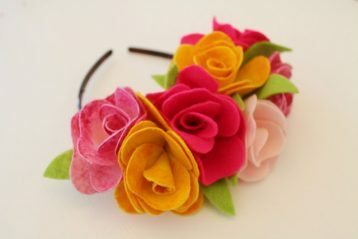 Gathered felt flowers would be sweet fixed to a headband. Felt daises look almost like the real thing! 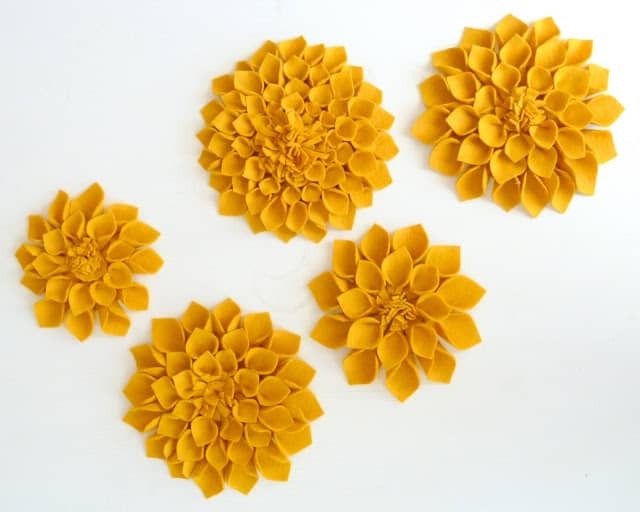 Beautiful felt Dahlias are a show stopper. 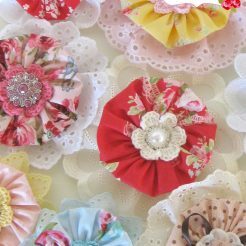 Scrap fabric flowers are fast, fabulous and fashionable. 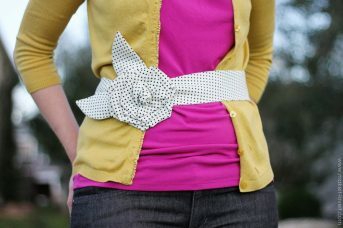 The coolest fabric flower belt is sure to knock your outfit up a notch. In case you were wondering how that little belt works, there’s a D-ring closure hidden behind the flower. 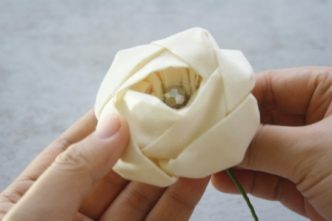 This round petal Kanzashi flower tutorial is so easy to make that you’ll be hooked once you get started. 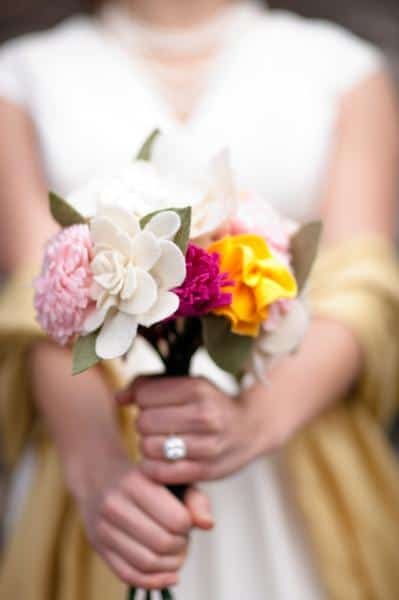 The basics on how to make the perfect flower add on to add just about anywhere you want to get a little extra pizazz. 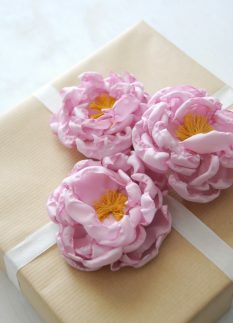 Create some gorgeous peony fabric flowers to adorn accessories and gifts. 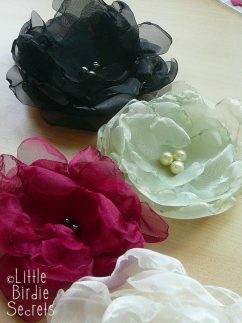 Organza flowers are made from layers of organza, tulle, and satin and a few pearly beads. 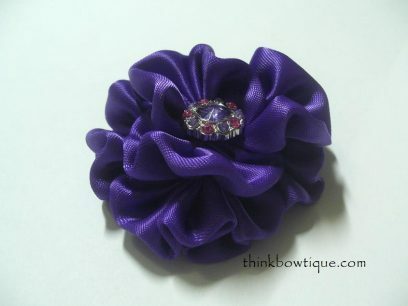 These are perfect for a hair clip or a pretty pin for your jacket or purse. Very classy. The silk lotus flower is elegant! 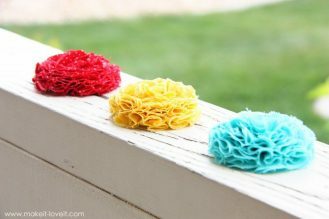 Stiffened fabric flowers are an easy craft project that’s a good way to use up scraps. 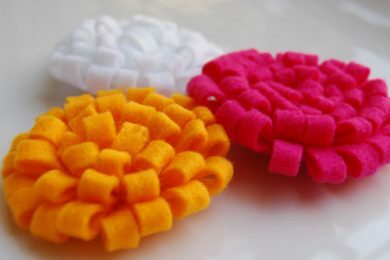 Use these flowers to make hair pins and boutonnieres, top gifts, decorate napkin rings, tote bags, wedding aisles, you name it. 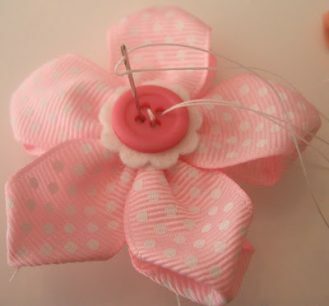 Easy Fabric Flower Tutorial that has a covered button detail for the center. 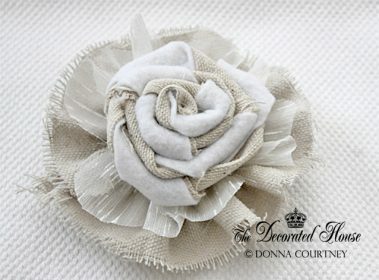 These full and textured fabric flowers are a bit rugged and raw but I like that. They can be attached, clipped, sewn, or glued………..to almost anything. Summer flower tutorial gives a step by step guide to creating amazing flowers. The added beading details make them extra special. Do you have extra fabric lying around? 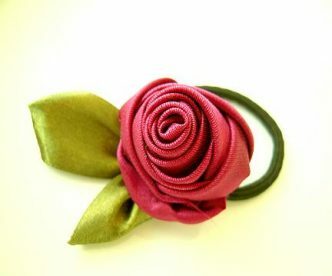 I love this pretty fabric flower made for a headband. 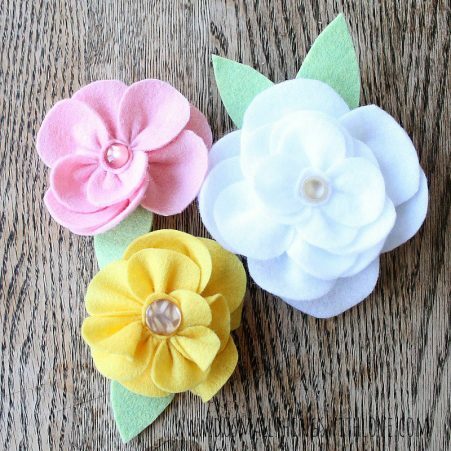 This simple flower tutorial is the perfect embellishment for a headband. Emily’s little world has me dying over the baby but t-shirt flower tutorial is a real keeper. 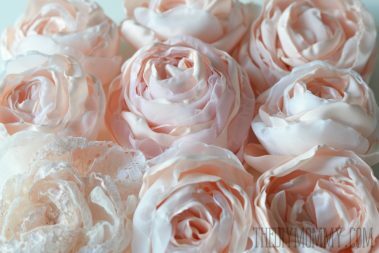 Everything is coming up roses with these fabric rose tutorials! Gorgeous cabbage roses are perfect to use in wedding bouquets, boutonnieres, and wedding decor. The vintage rolled rose using this rolled rose tutorial is a simple tutorial and each one is kind of unique according to how you twist and turn. Tighter pulling and twisting makes them have tighter smaller petals, while looser twisting and rolling will give you larger petals. 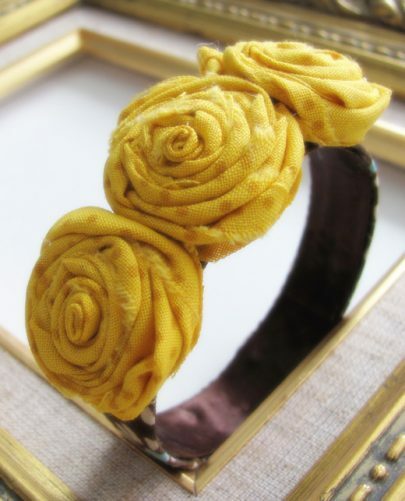 What a stunning rose hair band the fabric vintage rose tutorial makes! 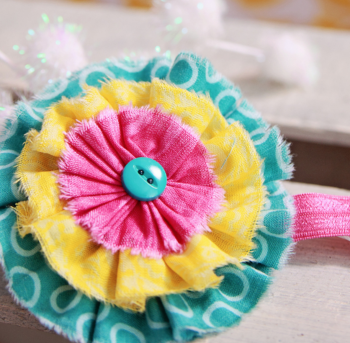 Make Gorgeous fabric yo yo hair clips using this yo yo tutorial. 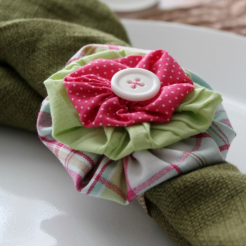 Pretty up your table with these yo yo flower napkin rings. Welcome guests with this yo yo flower wreath. Attach yo yo’s to a wreath form for a stunning entrance. 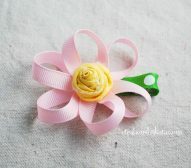 Handmade ribbon flower makes the most beautiful peony flowers. 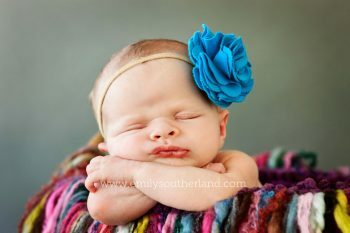 Darling loopy flower hair clip perfect for a special little girl. Gathered ribbon flower tutorial makes a full bloom. 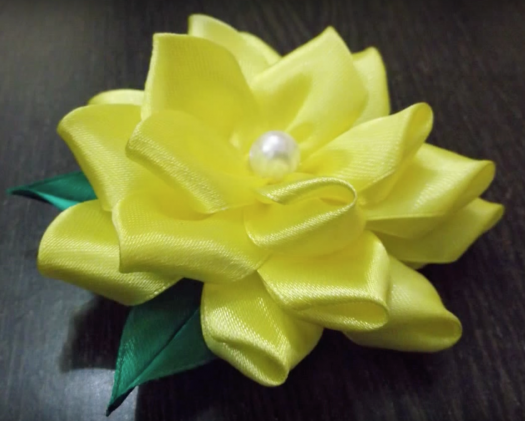 Make pretty flowers with this DIY satin ribbon flowers video! 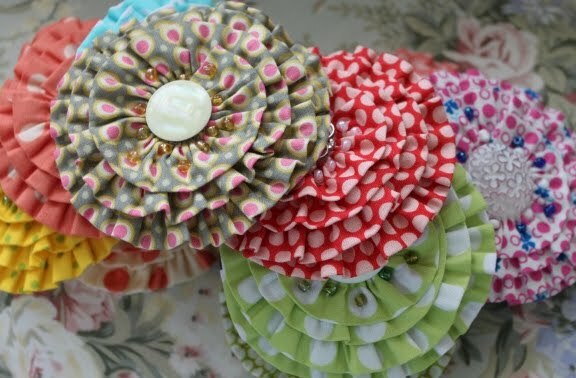 Love all these ruffled ribbon flowers! 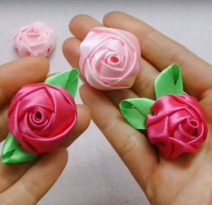 Ribbon Rose Video shows you how to make lovely roses. 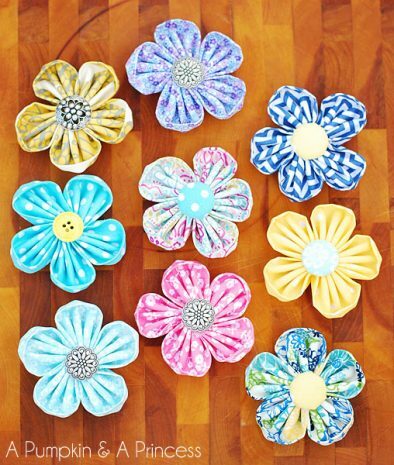 So many beautiful fabric flower tutorials. 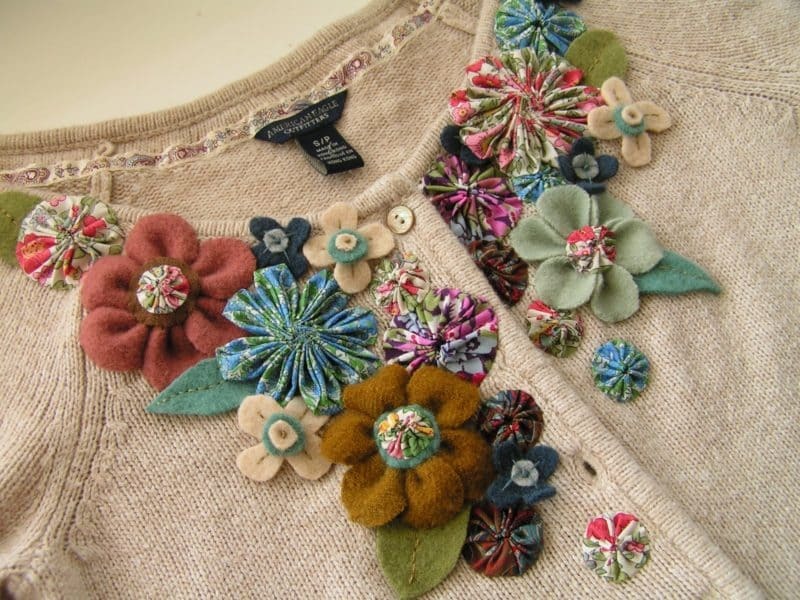 If you are wondering what you can do with all these lovelies, take a look at this amazing felt and fabric flower embellished cardigan. Complete tutorial! You will also love this crochet cap with large flower tutorial. If you like to crochet here are some beautiful crochet flower tutorials. A good number of recycled waste papers and aligned materials are used for the production of handmade paper. These are so cute, specially I like there usage on dresses.I can also replace them when I want to change the look of attire. Love all the pretty colors. A beauty that never fades. previous earning reports and some will be new. Follow Naked Lime on Facebook for details. Thanks for all the great tutoriols! Here is one I made. I'm trying to make a wreath for christmas (to be worn as a headpiece), but I can't find anywhere that tells you how to make poinsettias, holly, etc. Hey Natasja I will look! 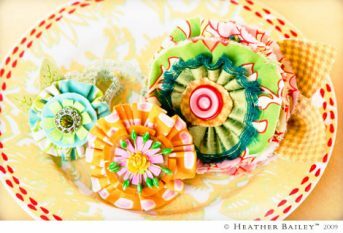 Your gorgeous designs, and wonderful tutorials are amazing, and I would LOVE to invite you to take part in one of my blogs! 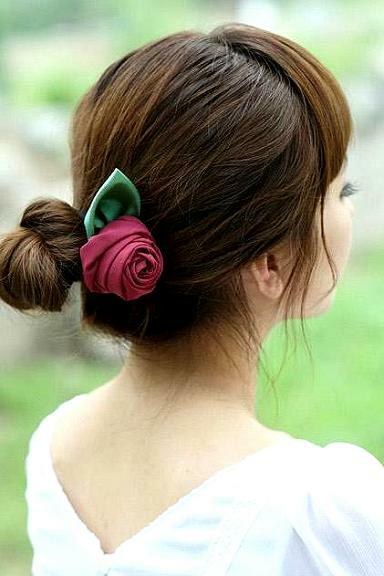 So far you're one of the best, and oh-so-creative flower accessory creator I've come across while surfing the web. That's a HUGE compliment coming from me! 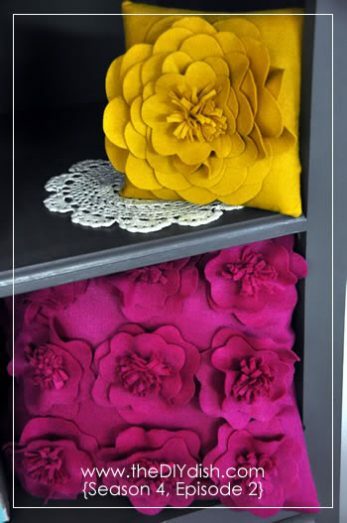 I adore all of the felt box fold flower, since I'm 6 months pregnant, and going to be having a beautiful, baby girl. We've decided on 3 names 1. (my day job), for going on 21 years now, and I guess you can tell I love floral names! Izabella - nickname Bella, which is a flower, and Lily is a flower. I had hippies for parents, and got Stargazer as a middle name. An I think my mother must have had e.s.p, because a Stargazer Lily is my favorite flower out of the 350,000+ odd species that exist. 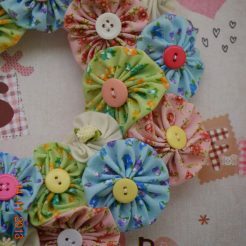 Anyway I also love the Rolled roses on the headband, the fabric yo yo's, and the scrap flowers. I love them all to put it short! I had it in mind to show off all your best stuff, add links to your blog here. As well as adding a few tutorials of yours, which will also be linked back here to your website! I'd love to email you all the info on the blog! I really hope you get back to me, I want to open a section on my blog for just arts and craft called: "The Artistic A+'s!" I know you would be the absolute perfect fit for the new sections first post! I have over 10,000 followers through Google Blog-Spot, Facebook, Twitter, and Polyvore! They all get an email as soon as I publish the blog. This gives them a heads up so they can go an check it out! Please drop by my blog, and become a follower. Because I'm definitely going to become a follower of yours! I'm so excited to hear back from you! I can put you as the 1st post for the grand opening of: "The Artistic A+'s" arts section. Which will be a big deal! Or since your creations, and designs, are also considered fashion accessories, I can just put you in the fashion section. Either way is perfectly fine with me! these r very good i like it actualy i m also good in art and craft i want to join u plzzzzz reply i m from pakistan i m full of ideas but without ur disition i dont think that......... plz reply. Thank you so much for this!!! 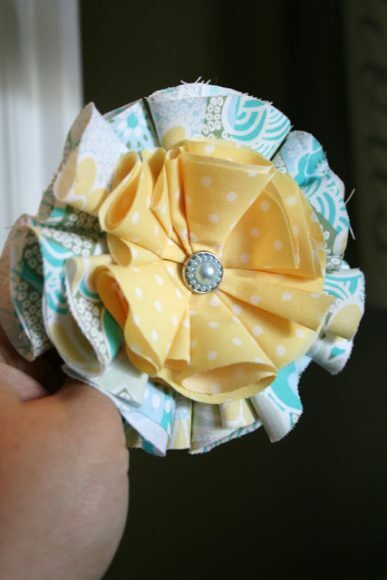 I am going to try to make some of these for my little girl that's on the way for some barfoot baby sandals for her! Thank you SO much for sharing these! They are all wonderful. This is so cool! I want to be a fashion designer when im older so this will be useful!!!!! thanx so much!!!! 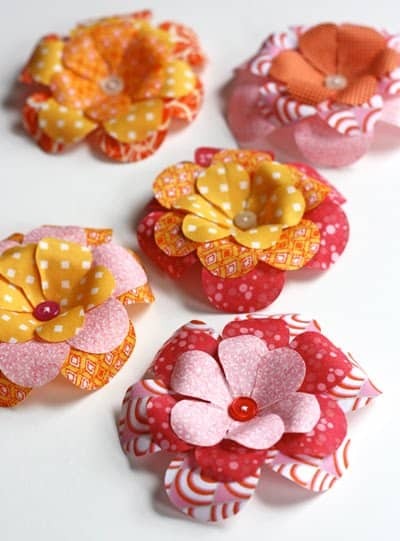 These are fantastic tutorials and it looks like there's a flower to be made no matter the type of fabric. Thanks so much for posting and sharking! This is a wonderful website, I just found you! 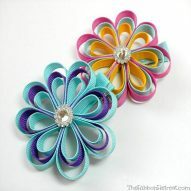 I also am making zipper flowers and hair clips. Time consuming, but I love it. I don't have a website, but I also make soap. rubyandme/feel good soaps. I just found your website online and I saw that you're selling haberdashery. We are a whole sale company in China and I'd like to provide those products for you directly from China (see link below). I really enjoy your website. it always has so many great idears to try and to. thanks for the time and and talent you share . will always refer readers your way. So glad I found this link from over at The Little Red Squirrel. 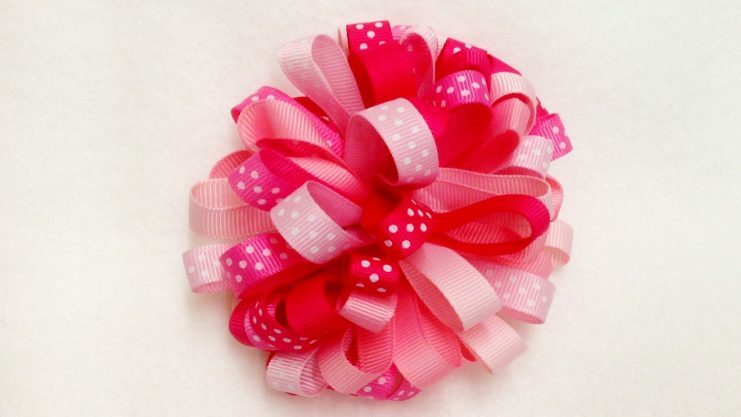 I plan to make flowers from your tutorials as the bows for my Christmas packages (to girls)! I've been looking for something like this...thanks!! hi dear i love you nice blog. thank u so much. Great tutorials! Just what I was looking for. I will be trying some of them soon for some purses I am making. Thanks so much for sharing!! Thank you for sharing all the fun ideas for the rest of us that need instructions and are not as creative as you are. Wow this is awesome stuff!!! Very cool! 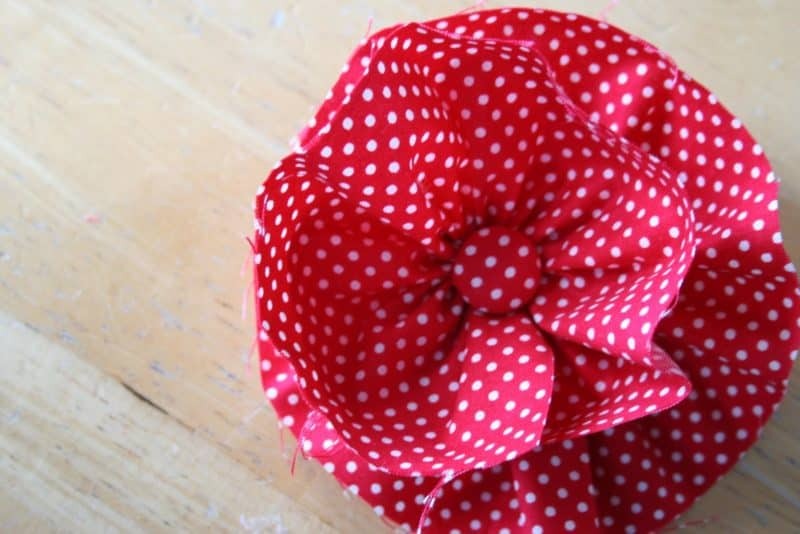 I've bookmarked this page for when I ever get around to making more fabric flowers (in my free time, ha ha!) Thanks for making it all concise and consolidated! If anyone wants to learn how to make silk flower hair clips, here's a tutorial I put together last week! Oh wow! I am bookmarking this page for sure! So many great tutorials in one spot, I love making bows for my girls! Thanks!!! 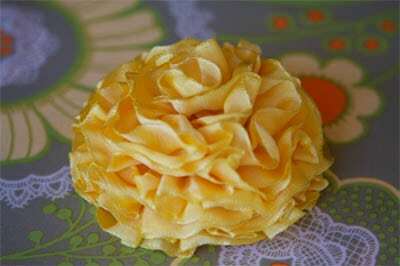 My first craft tutorial - which was recent - was on making fabric flowers ala the rag quilt method. I never thought I'd be into fabric flowers, but after doing this and then seeing all these pretties, I'm definitely going to be making some more! I like using them as embellishments for scrapbooking and other various projects. Thanks so much for sharing all these tutorials! Cindy this is such an amazing round up. 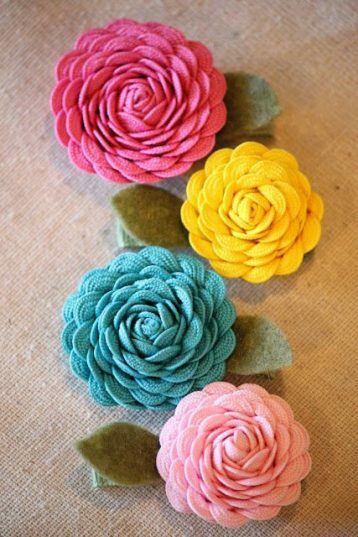 I ADORE fabric flowers. They're seriously amazing eye candy and so much fun to wear. Thanks! Just what I needed today!